Professor George Lin, Director of International Centre for China Development Studies, HKU will be the moderator of the lecture. Since 1978, Shenzhen has transformed from an experimental platform for economic reform into a dominant city at the crossroads of the global economy. The first of China’s special economic zones, Shenzhen is today a UNESCO City of Design and the hub of China’s emerging technology industries. Learning from Shenzhen. China’s Post-Mao Experiment from Special Zone to Model City presents a unique multidisciplinary account of China’s contemporary transformation via one of its most important yet overlooked cities: Shenzhen. Bringing together ethnographic research, spatial and geographic history, as well as the analysis of political discourse and ideology, this volume explores how the post-Mao Chinese appropriation of capitalist logic led to a dramatic remodeling of the Chinese city and collective life in China today. These essays show how urban villages and informal institutions enabled social transformation through cases of public health, labor, architecture, gender, politics, education, and more. The volume also explores the relation between plans, models, and experiments. How has Shenzhen come to function as a key site of radical transformation of socioeconomic social relations and of overall reversal of the socialist ideology? How has it become a model for the whole of China in terms of not only economic reforms but also of transformation in moral values? How to make sense of and document both the utopian and dystopian facets of the « Shenzhen miracle », embodying at once a tale of economic success and the combined effects of the structural violence of global capitalism and authoritarianism? How to define Shenzhen’s “spatial exceptionalism” and its effects on space, subjects and urban form? How have borders been turned into sites of production, hierarchization and intensification of values for people, commodities and ideas? How does Shenzhen’s experience speak to the reconfiguration of contemporary global economic space and to the understanding of modes of governing? These are some of the questions that will be discussed in this book launch seminar. M. O’Donnell, W. Wong & J. Bach (Eds.). 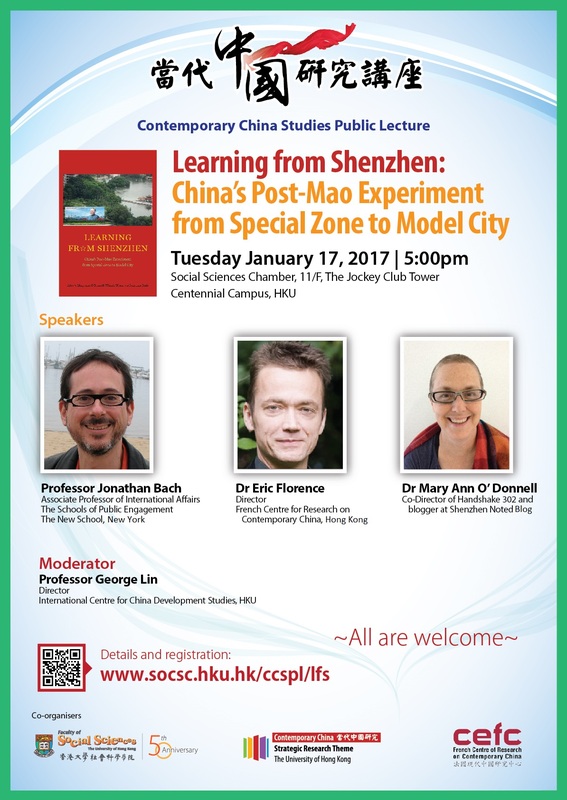 Learning from Shenzhen: China’s Post-Mao Experiment From Special Zone to Model City, Chicago, University of Chicago Press, 2017.